Starting in early October, the first car of each subway will be reserved for first-class passengers. The first-class fare of $89.95 will buy morning commuters a reclining massage chair, a glass of fine champagne, and a monocle and top hat to make them look extra fancy on their way to work. The evening commute will include a concert by the New York Philharmonic Orchestra and a menu of saffron risotto with mussels. MTA officials hope that this latest move will not only boost the economy, but also provide passengers with a more refined mode of transportation while offering them the opportunity to take public transit and congratulate themselves on being so eco-conscious. The MTA will also be offering premium services to first-class passengers for an additional $199.95. 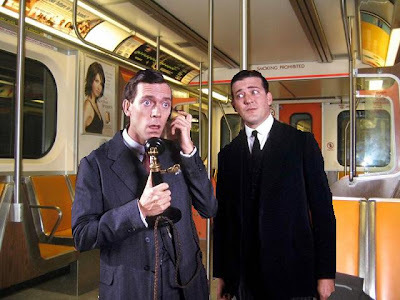 After the passenger leaves the subway, an MTA-employed butler will spend the day following the passenger around saying things like, "I endeavor to give satisfaction, sir," and commenting on the latest in the fledgeling romance between Madeline Bassett and Gussie Fink-Nottle. The premium first-class service will also provide opportunity for hijinx between the wittier MTA employees and their bumbling passengers. This includes--but is not limited to--accidental engagements, cases of mistaken identity, and wealthy aunts making unannounced visits. MTA officials hope that the profit from the premium service will help them to fulfill a lifelong dream of being able to make the tracks out of solid gold and provide each of them with a summer villa. 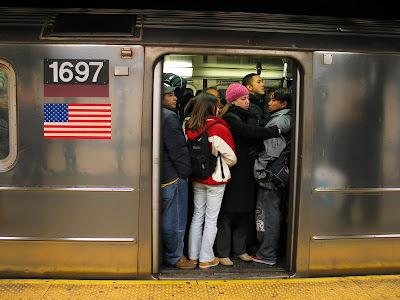 Normal passengers will continue to ride in the other cars, which the MTA assures us will be as overcrowded and smelly as ever. They are also considering having the 6 train run once a day and be filled with baboons, while the G train will remain imaginary. It should be noted that, in the case of a train delay, regular passengers will be expected to carry first-class passengers to their destinations. And when I thought I couldn't love you any more than I already did, YOU WENT AND MADE A "JEEVES AND WOOSTER" JOKE. And the tourists will be even lower than the peasants. You can tell who they are by their wide-eyed looks and broken fake Rolodexes. @nadarine: Careful. If you try too hard, I may have to go live in America for a few months. @breakingblues: And how they all fall over when the subway moves. I would pay for the premium service if I got Stephen Fry as my butler for a day. G service is not imaginary down my way, where it always always comes first when I'm waiting for the F.
@jen: LIES! The G train is a figment of our imaginations. There is a special MTA team whose job it is to hypnotize people into believing they saw it. but your time in the swank Art Deco penthouse in New York will do you good, darling. You certainly can't get into any sort of scrapes in New York! What ho, what ho, what ho?